Who here is guilty of putting off holiday gift shopping until the last minute? –don’t worry, you can be honest, we won’t judge! As a matter of fact, we totally understand the struggle. With the end of the year slowly approaching, there’s always so much left to do! Especially if you have little ones of your own. You’re already their personal assistant, chauffeur, and cook on a day-to-day basis, the holidays just add to your never-ending list of to-dos. Now you have to worry about holiday performances, activities, parties, AND gift shopping?! “Me time” is already practically non-existent and with the holidays it just seems like an elusive fairy tale. This year, we’re here to help. Allow us to introduce to you Ashley Rose Clothing. We were talking with the lovely Ashley herself during a car ride one day and thought it would be cool to team up and have a photo shoot for her for her Fall/Winter ’18 collection! And we have to say, our models were the absolute CUTEST! For those of you who have just now discovered her clothing line let us share with you what she’s all about! After moving to Hawaii, Ashley started her business in 2016. Unlike many businesses who are profit driven, she focuses on building her brand based on mindful consumption and high quality products and recognizes the importance of our relationship with the community and environment. You can read more about her story here! We did our best to make everything look picture-perfect for this special day! To capture the moodier vibes of fall and winter we brought out our Emerald Velvet Sofa. Bonus: the extra comfy cushions and soft velvet were ideal for the little ones. To add a pop of color we layered our Round Jute Rug over the Indian Chindi Rug! One great aspect about her products is that certain pieces are gender neutral! Which means, you no longer need to worry about finding those matching outfits for family photos (and everyone looks great!). 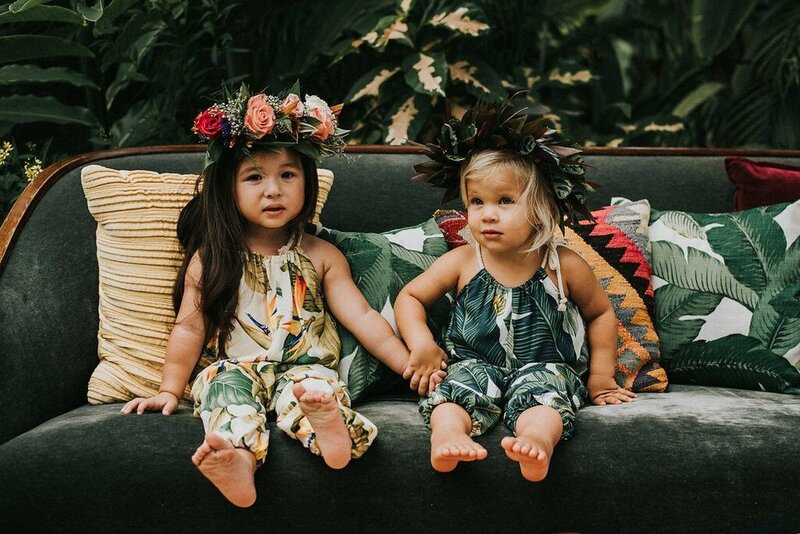 We were already fond of the banana leaf design on our pillows –but these adorable banana leaf outfits have made us fall in love all over again! 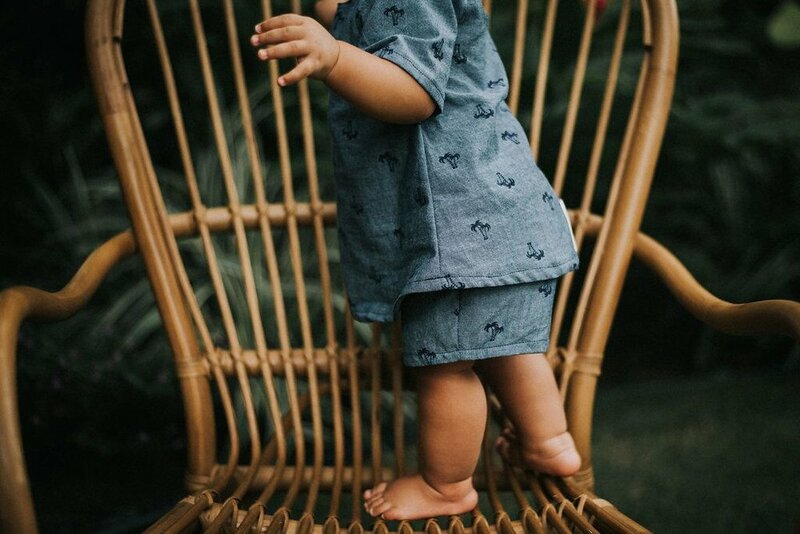 The nice thing about her pieces such as the Frankie Romper, is that they can be worn in any type of weather! Either wear it on it’s own during warmer weather, or over a layer or two when it’s chilly out! Are you sold yet?! If you’re still on the fence, if you sign up for her newsletter you receive a 15% discount on your first purchase! And because it’s online you don’t even have to leave the comfort of your home! We wish we could get a few of these pieces for ourselves! End the Year in Style: 6 weeks left to book up some magic!